We’ve 3D Printed Batman. Why not 3D print his greatest foe too? This mask is not only just an awesome example of what can be done with 3D-printing: It’s also bloody petrifying. Based on the gross incarnation of the Clown Prince of Crime that got his face sliced off to wear as a gruesome mask in Batman: Death of the Family, this mask was made by Stefanos Anagnostopoulos (who also recently made this nifty Ant-Man 3D-printed helmet). 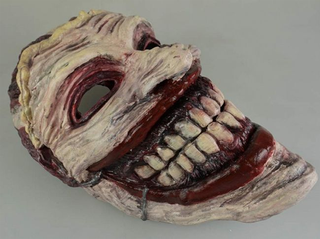 Anagnostopoulos sculpted the mask in Z-Brush, before printing it in six separate pieces, gluing it together, and then painting to make it look incredibly freaky look. It’s nightmarish enough when it’s just sitting there, when it’s strapped to someone’s face? JAYSUS BEGORAH. That’s just gross. And awesome. But gross. Want to make one yourself to scare the living daylights outs of people? You can download the instructions here.